Hello, my friends! Here’s the promised comparison of Ivy and Parker (Truly Me #40). 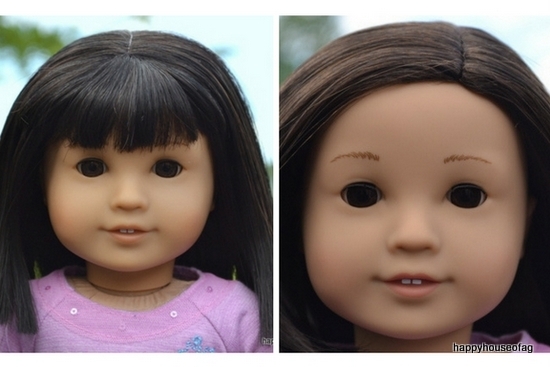 American Girl’s Asian dolls all look pretty similar, and it’s a bit of a shame. Give some of them freckles or side bangs or a different eyebrow shape — just something to make them stand out from each other. Anyway, in this post, I’ll be pointing out the differences between my two lovely Asian AGs. They both have the Jess face mold, and feathered eyebrows. I feel like Ivy’s skin has a more yellow tone to it than #40’s. Ivy’s eyes are slightly different from #40’s. Her eyes are decal brown (#40 has the regular brown), and there’s some light brown around them. They both have dark hair, but Ivy’s is black, and #40’s is brown. Ivy’s hair is parted down the middle, while #40’s is parted on the left side. Ivy has shoulder-length hair. #40’s goes about an inch and a half past the shoulders. Styling Ivy’s hair can be quite difficult. It’s too short to do much with, except for pigtails. #40’s hair is long enough to do most hairstyles, although i think a bun would be difficult (but possible). Since Ivy was retired in 2014 (before the awful zip ties were reintroduced), she has neck strings. I got #40 in January, 2017, so she has a zip tie. Her head moves pretty easily, though. And, of course, the main difference between them is that Ivy has bangs. They’re both beautiful dolls, and I wouldn’t really recommend one over the other. You can do more with #40’s hair, though. And she would be easier to purchase, since, unlike Ivy, American Girl is still selling her. Which do you like better: Ivy Ling, or Truly Me #40? They are so cute! You did it! You got this up before July! Good job! Good job on comparing them and I totally agree that they need to add diversity in their Asian dolls. yep, i did, i’m so proud of myself. XD yeah, ag’s white dolls are pretty diverse, but their african and asian ones aren’t that different from each other. oh yeah, you’re right! #66’s hair seems a bit longer, though. I love this! This was very fun to read. I don’t know which one I like better. 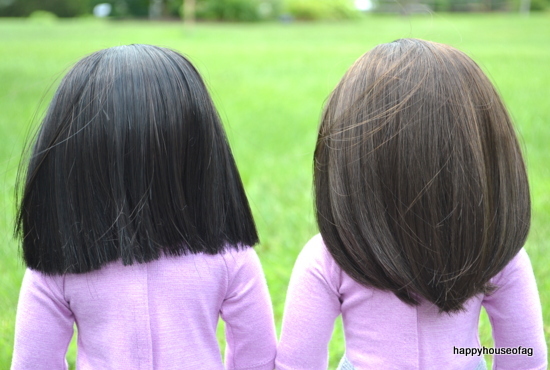 Their African-American dolls are pretty much the same too. thank you! yep, the african american dolls definitely need some diversity. Totally, Gabrielle McBride, retired Cecile and one of the TM dolls, (don’t remember which one) are like identical. I definitely love Parker over Ivy. I love the brown, longer hair over the short black hair. I just love everything about Parker. Ivy is quite similar, but Parker,in my opinion, is a cuter version. I love them both but if it were my choice, Parker is the right choice! they’re both pretty, but, yeah, there’s something about parker’s face that’s a little cuter. I like Ivey a little better, because of her bangs. But # 40 is adorable too! Both are adorable dolls. I wish as well, AG would have more diversity with Asian dolls, maybe one with really long hair! :D Great job as always. yep, they are. :) oh yeah, that would be really cool! Gret job on the pictures, and they both look so cute! AG should do a freckled Asian doll! that would be so cool! Or they could also make another Asian face mold, to give it diversity. Well, there is the Asian mold (aka the #4 mold), but AG never uses it!! It’s a shame, it’s a really cute face mold! Yeah! I knew about that one, it’s a pity they only used it for #4.
thank you! 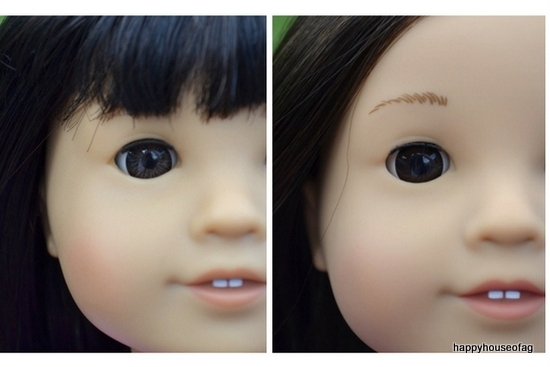 yeah, i think freckles on one of the asian dolls would be absolutely adorable. I would completely die if they did that! It would be so cute! Another difference between Ivy and #40 is Ivy’s eye cut outs. That’s why they are sometimes considered as 2 different molds: the Ivy mold and the Jess mold. Yes, AG needs more diversity. I agree with Alyse, a new Asian mold would be awesome! yeah! maybe a new eye shape would be cool. thanks! hopefully you can find her on ebay someday. i know, they look so cute together. they could be sisters or cousins or something. I like #40 better, but my favourite Asian doll is #64. #64 is beautiful. i almost got her instead of parker. 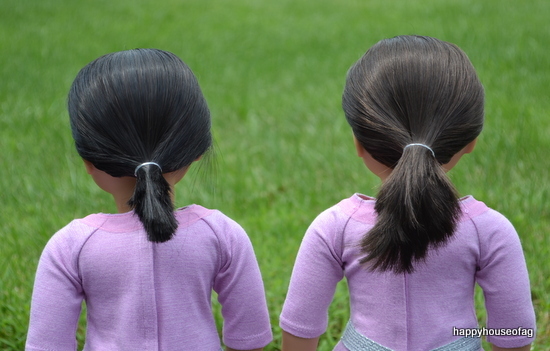 Aww, Asian dolls are so cute! I wish I had one. But I don’t think I have much more room for a 12th doll…. Oh well. I really want Jess or Ivy. Just curious, what are your thoughts on Z yang? jess is so pretty. i spent a long time looking for her on ebay. z is cute, and i love all the photography-related things in her collection. but she doesn’t look that different from the other asian dolls. yeah, it’s a bit of a shame, they seem to be running out of ideas for GOTYs. Both of the dolls are adorable! Wow! You actually posted this before July! Great going! 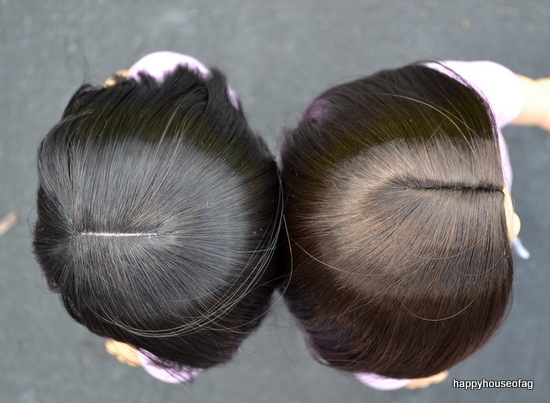 Great comparison, and we too agree that all of the Asian dolls look the same. P.S. Compared to Ivy, Parker’s hair looks really brown, unlike the dark, dark, brown it usually seems like. yeah, i thought parker’s hair was a lot darker before i compared it to ivy’s. Hi Loren! 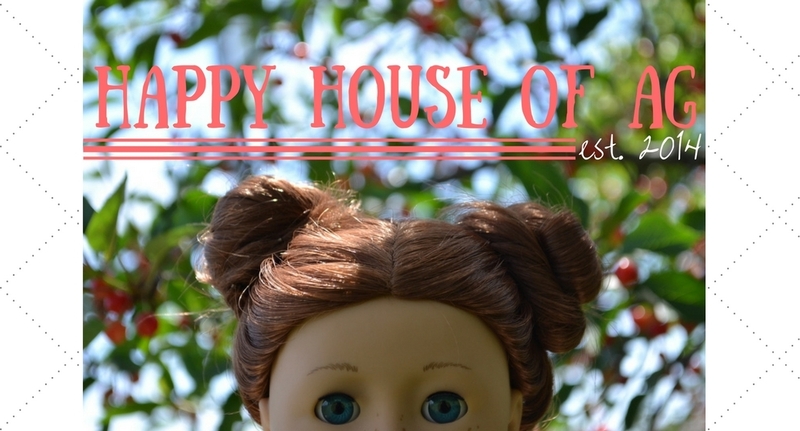 I just started my blog in June of this year! If you’d like, you should check it out! They’re both really cute dolls. And sorry for the late comment. I think I like Parker more than Ivy. I love Ivy. I also have Z, JLY #4 (first version) Jess and Kanani.